In the preceding step, you built the files for the Employees JSON type in your development environment. 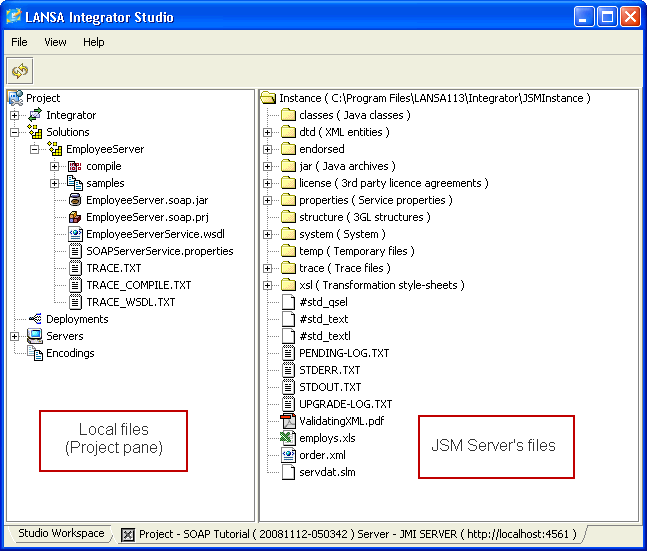 In these next steps, you will move the properties file to Integrator and then to the JSM server. 1. Display the Project tab for your project in the LANSA Integrator Studio. So that you can see your project's files, expand the Solutions folder, then expand the Employees folder. a. Highlight and right click the HTTPInboundJSONBindService.properties file to open the context menu. b. Select Send To and then Integrator Folder from the context menu. c. Click Yes when asked if you want to update the file HTTPInboundJSONBindService.properties. d. Highlight and right click the HTTPOutboundJSONBindService.properties file to open the context menu. e. Select Send To and then Integrator Folder from the context menu. a. Highlight the iiiEmployees.json.jar file to open the context menu. 4. Collapse the Solutions folder and expand the Integrator folder. 5. From your project tab in Studio, open your server instance so that you can move the properties and jar files to it. c. Select the appropriate server and right click to Open Server. d. Your Project tab will now show both your local files and the JSM server's files. b. Right click to open the context menu. You will now see the jar files in the bindings folder of the JSM server. 7. Move the properties file to the JSM server. a. Highlight the properties file HTTPInboundJSONBindService.properties in the properties folder of the Project pane. c. Select Publish Section from the context menu, and select Yes in the Confirm dialog. 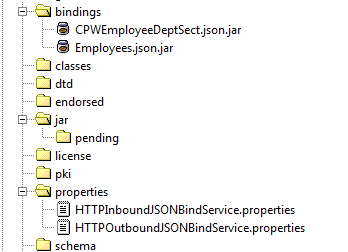 d Highlight the properties file HTTPOutboundJSONBindService.properties in the properties folder of the Project pane. e. Right click to open the context menu. f. Select Publish Section from the context menu, and select Yes in the Confirm dialog. Your properties files are used to add a section to the JSONServerService properties file on the server. 8. Re-start the JSM Server when new changes have been published. b. Right click in open the context menu. 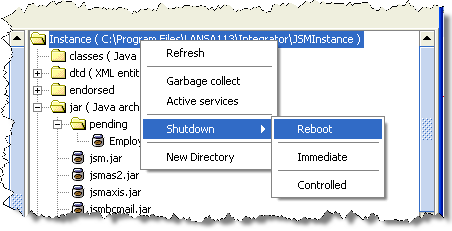 c. Select Shutdown and then Reboot from the context menu.